If the teeth are acceptably aesthetic except for being discolored a tooth whitening process can easily and comfortably brighten a smile, making it more youthful and attractive. Tooth whitening is fast, comfortable and cost effective. Speed of results depends on the strength of solutions and the starting color of your teeth. 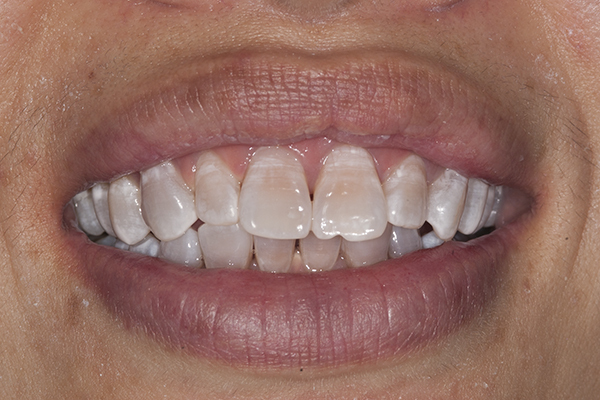 All teeth do not whiten at the same rate but with repeated applications all teeth will whiten to the degree you desire. In-office: strongest, yielding quickest results (1-1.5 hours). Teeth must be pre-evaluated to assure comfort and promising results. At CDE we use the KOR system for maximum whitening potential. It involves a two step process: at-home and in-office. It is the most comprehensive system available for heavily stained teeth. The material is refrigerated from the moment it is produced to ensure there is no deterioration of the whitening chemicals occur due to climatic effects (heat/cold). The color in the above cases has been greatly and evenly reduced in one in-office and 1 week at-home treatment. At home : You can also consider a combination of systems for optimal, long-term results. 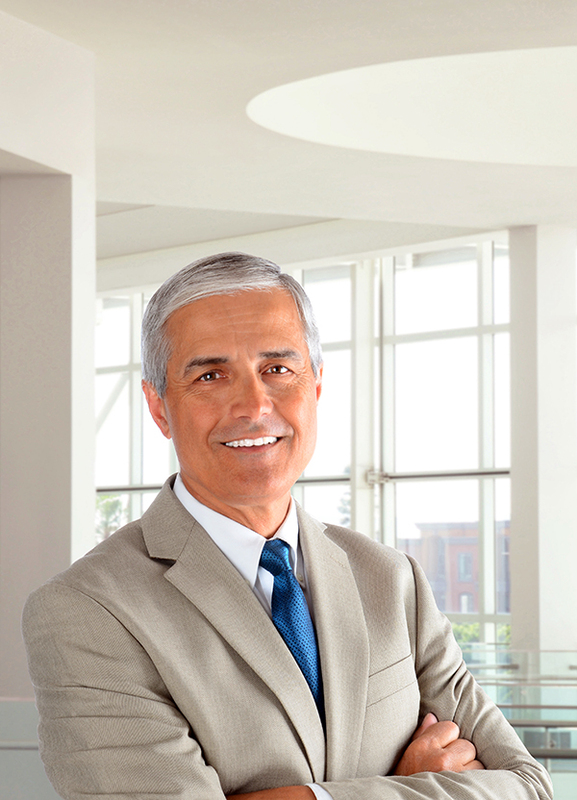 It is always recommended to maintain your in-office whitening with an at-home product, either OTC or from your doctor. Any dental office product will always be stronger than OTC; that is a FDA ruling. Opalescence is a less intense chemistry than KOR. 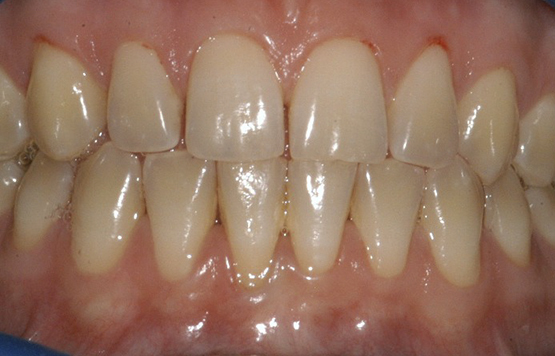 It is a very good process for teeth that are mildly stained or discolored. Over the counter whitening solutions: they are the weakest solutions and take longest, but they is also may be the least expensive alternative for touch up whitening. OTC products also only cover 6 front teeth. To cover more teeth you must use 2 strips, doubling your costs. The whitening process is a chemical process called oxidation ( equivalent to using bleach on clothes). This removes chromophores from the tooth structure, thus the color tone lessens. The more applications you perform the more the teeth will whiten. 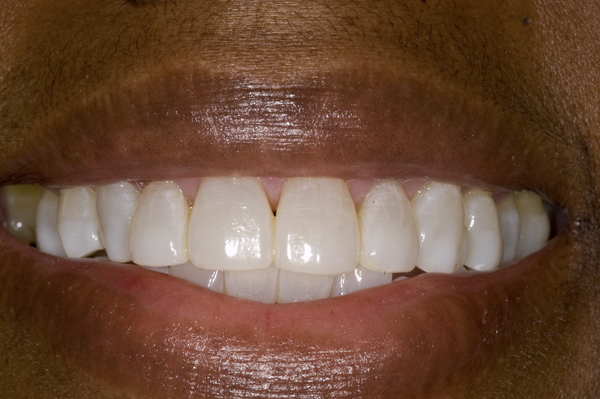 The whitening process also makes the tooth more opaque. 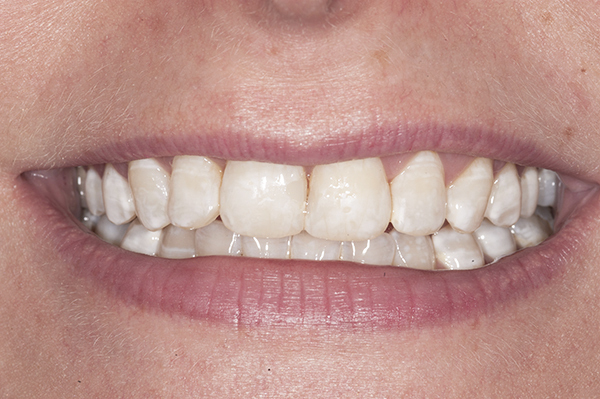 An opaque tooth, versus a translucent tooth, bounces more light back to the eye making it whiter. The whitening process also dries out the tooth momentarily (up to several days). Drying out a tooth makes it more opaque. The true degree of whitening will only be seen after the moisture reenters the tooth. Continue with at-home whitening to maintain the perfect color. 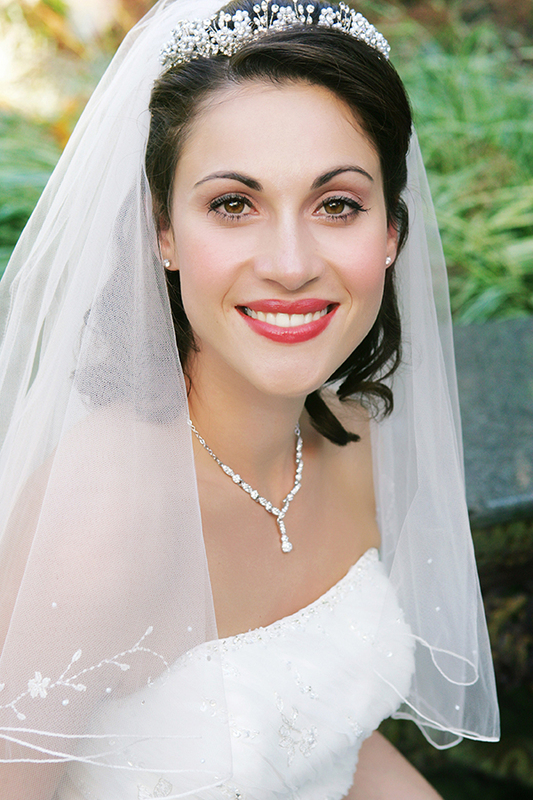 For an important night out or event, whitening the day of or before will optimize the whitening effect. If your teeth have decalcifications (white spots-below) they will absorb whitening processes faster making them go whiter than the remaining tooth structure. 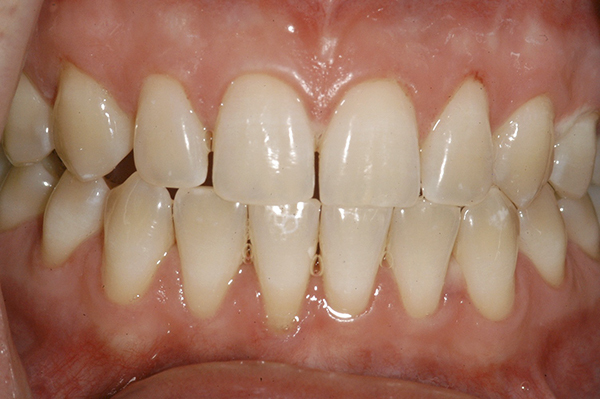 In addition, as seen below, decalcified spots will also dry out (dessicate) faster making them go whiter faster than normal tooth structure even without whitening. That is normal. 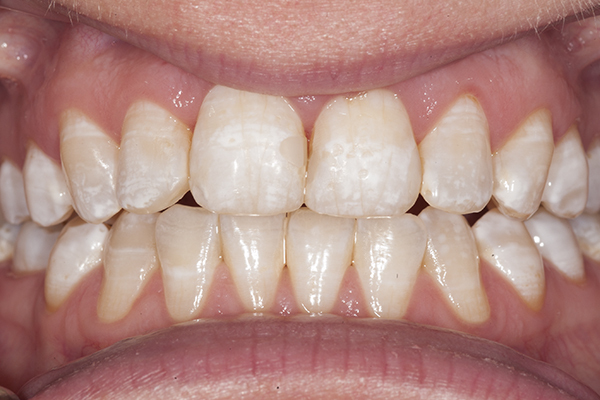 Immediately after any whitening process these spots POP out and look worse than before whitening, but after a few days the true benefit of the whitening process will become evident as the white spots recede and the remaining teeth display their whiter appearance. So do not panic; all is well in the end. Continuing with at-home whitening will even out the appearance of the teeth over time. It may be necessary to place thin veneers over severely calcified and stained teeth after whitening (tetracycline staining). As can be seen above the KOR dramatically lightened the teeth at the appointment and after 1 week the teeth were overall whiter but because the decalcification spots remoisturized, they no longer were prominent. 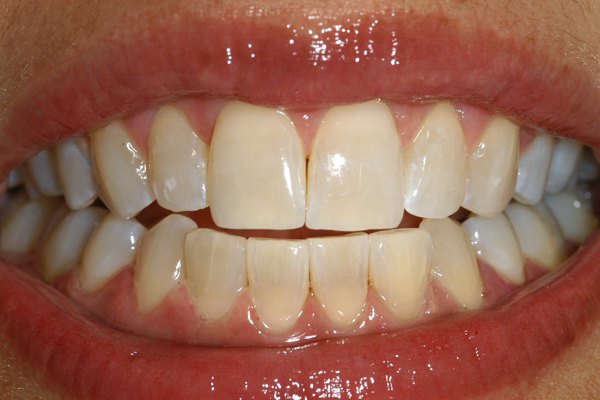 This occurs with most white spots anytime the mouth is kept open and then remoisturized. 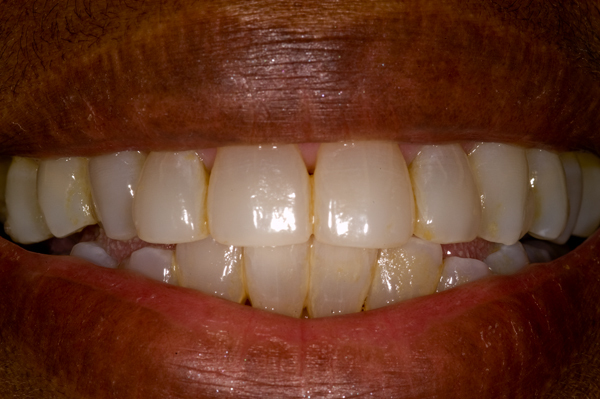 Continued whitening at-home is best in this patient's case to slowly and continuously whiten the more normal enamel that has excess chroma. 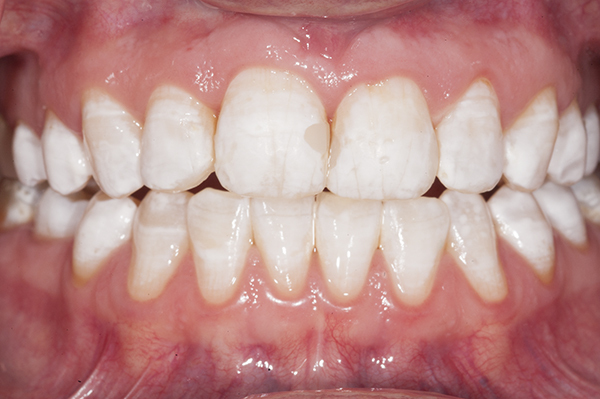 In a case with tetracycline stain and decalcifications the best option is to whiten extensively to bring all the dark color to a much lighter, more opaque shade. 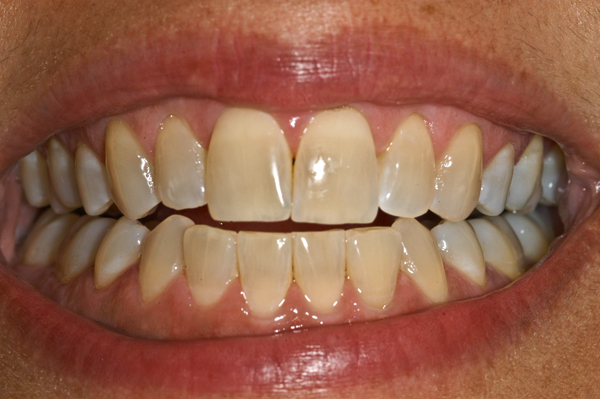 These teeth had multiple at-home sessions and 2 in-office treatments creating significant improvement. 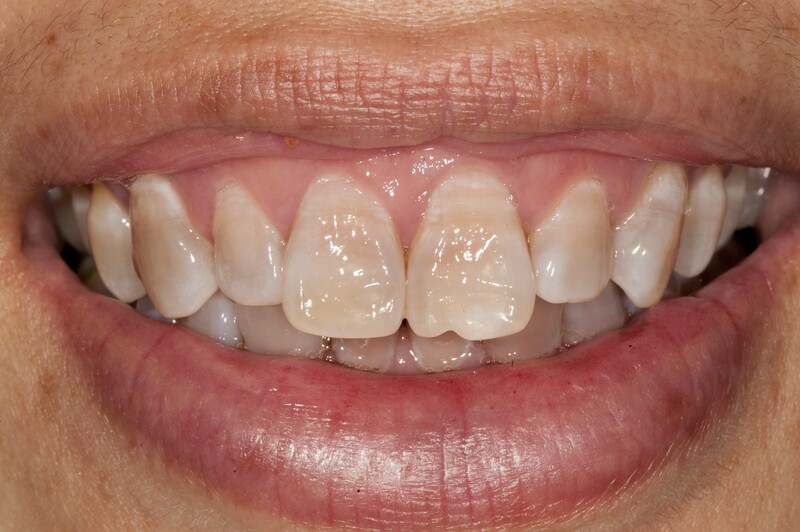 Dr. Prus , in a case such as this, will also incorporate an Inman Aligner for anterior tooth repositioning then finally place appropriate all-porcelain restorations that mask any remaining colorations and surface irregularities and maximize aesthetics. (Case in progress; fuller explanation of treatment in Full Mouth Reconstruction.